Investigations Bureau have focused on solving multiple motor vehicle thefts from our area. 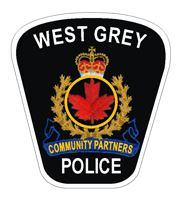 As a result of the two-month long investigation, the West Grey Police have successfully recovered four motor vehicles, three trailers, one ATV and one stolen firearm. The listed property was located in various locations across the region, and police estimate the value of the recovered stolen property to be approximately $120,000 dollars. Subsequently, 11 people are being charged with 30 criminal code offences. Police are reminding the public to always lock their vehicle doors and to never leave their keys in the car. This investigation is on-going and anyone with any information in relation to these thefts is asked to contact the West Grey Police Service at 519-371-6911 or to contact Crime Stoppers at 1-800-222-8477 should you wish to remain anonymous. On March 8th West Grey Police received a call from a concerned resident stating that he saw a male party who appeared to be in his 50’s attempt to enter a locked vehicle in a driveway on Countess Street North in Durham. The complainant obtained a possible license plate number of B??376. The suspect left the scene in a vehicle which headed Northbound toward Durham Road West. Police were unable to locate the suspect vehicle and are asking anyone with information to contact the West Grey Police Service at 519-371-6911 or Crime Stoppers at 1-800-222-8477. On March 2nd a property owner on Grey Road 4 whose lot is accessed from Concession 2 NDR observed a young male, described to be in his 20’s with long blond hair, driving a lifted baby blue truck trespassing on his property fishing on the river. The male walked away as he was approached and left without incident. On March 4th and 5th 2019 police received calls from a Glenelg property owner who is having ongoing issues with snowmobilers leaving the trails and trespassing on his property. The public is reminded to be mindful of where they are allowed to be and not to go on private property without the owners’ consent. On March 6th, officers were notified of an assault. A male party bound by conditions of release from the court was not abiding by the conditions set out in his release and his surety called police wishing to revoke. The male party became angry and assaulted his surety. An arrest warrant for the accused on charges of assault and breach of recognizance has been sought.